Once you've cut a potato, the oxygen in the air interacts with its carbohydrates and darkens the flesh. 3 Can You Freeze Uncooked White Potatoes? Potatoes turn black just under their skin if they are dropped or stored in temperatures below 40 degrees Fahrenheit. They also darken when their carbohydrates are exposed to oxygen. To keep your potatoes from turning black, handle them with care and give them a cold-water bath after peeling. Store potatoes in a dark spot with good air circulation and temperatures between 45 and 50 degrees Fahrenheit. Avoid storing near appliances that generate heat or in the refrigerator, where the temperature ideally should be 40 F or below. 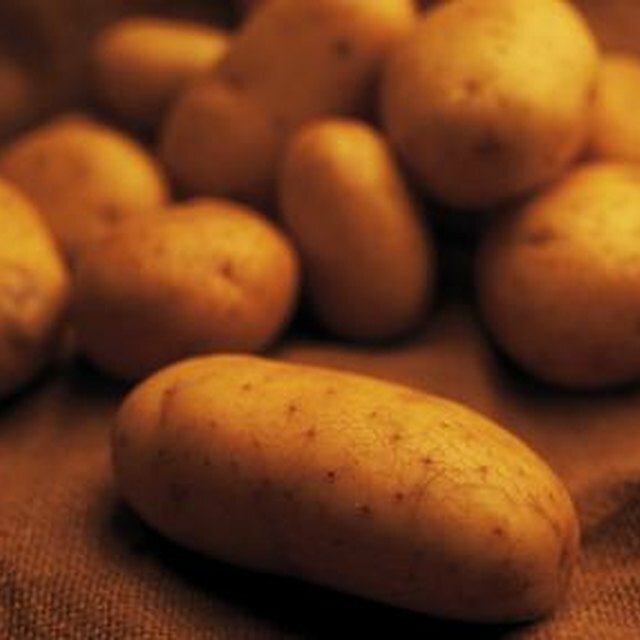 As soon as you peel the potato, submerge it in cold water to stop the darkening process caused by exposure to oxygen. If you’ve dropped the potato and the black spot doesn’t disappear after soaking, cut away the discolored areas before eating.